Saving Downsyndrome » Down syndrome eugenics – We must draw the line here, now. Down syndrome eugenics – We must draw the line here, now. The Telegraph reported this week that an alliance is launching a new push to restrict the UK 1967 Abortion Act, to prevent doctors terminating pregnancies on the grounds of physical abnormality. SavingDowns applauds this initiative. We advocate for the repeal of “foetal abnormality” as a grounds for abortion in New Zealand, as this discriminates against our community. The comments blog of the Telegraph report are the usual mix of pro-eugenic ideology about people with Down syndrome being a burden, suffering, a disease etc. We’ve seen it all before. One thing that doesn’t change is the basic concept of eugenics, that somehow people with varying abilities are of less worth. It basically hasn’t changed since Karl Binding and Alfred Hoche published “Allowing the destruction of life unworthy of living: Die Freigabe der Vernichtung Lebensunwerten Lebens” back in 1920, eventually manifesting into the Action T4 killing programme against the disabled. Down syndrome was the first of 6 conditions listed in the T4 authorisation. Children under the age of three were taken to institutions and then gased. But why do we even have “foetal abnormality” as a grounds for abortion in New Zealand and how does it link with eugenics? Down syndrome was discussed at length in the Commission’s report. For the handicapped we have the term “fetus”, for the rest we have “unborn life”. Clearly we have a discriminatory law, steeped in eugenics and based in a view that people with “handicaps” have “life unworthy of life” because they are a burden and are not happy. My daughter has Down syndrome. She is a joy, not a burden and delights in her happiness – but I digress. So by what right are those with Down syndrome not human beings worthy of the same treatment as others? 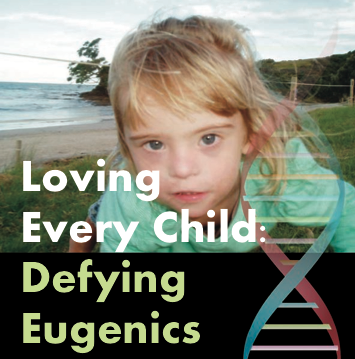 In July SavingDowns held the “Loving Every Child: Defying Eugenics” seminar. Presenter Rita Joseph asked this exact question and explored the human rights case against eugenic birth prevention. Rita is a veteran human rights campaigner, with a vast and deep understanding of the value of human life. Let me share some of Rita’s’ presentation. A quick review of any mainstream blog discussion on screening for Down syndrome will show all of these perfidious notions. In this year’s April issue of The American Journal of Bioethics, two eugenicists argue quite seriously that the possibility of screening out embryos with defects carries with it a parental duty to produce only children free of these defects. See how quickly the right to choose to abort children with a troublesome condition can become the duty to abort these children. And so, quite arbitrarily, they draw up an insidious dividing line between those they deem to have a right to live and those they deem expendable. This is the type of mentality out there, you have a choice, but the moral (read “right’) thing to do is to choose the eugenic option. How soon will we be faced with “you chose to have a child with Down syndrome” so the State withdraws support for your child as part of your “social contract”? It’s call social engineering and it’s already started in New Zealand towards beneficiaries and solo mums. Under Hitler, in the 1930’s and 40’s, the Nazi medical authorities instituted what they believed to be a very noble, successful programme of eugenic selection. Historians tell us that children with Mongolism (we call it Down’s syndrome today) and “severely defective closure of the vertebral column” (Spina Bifida) were listed by Nazi decree to be ‘selected’ for ‘euthanasia’. The lives of children with these “conditions considered a basis for killing” were terminated by Nazi doctors. Indeed, according to historian Henry Friedlander, these children comprised the very first group – the original “group” – targeted for eugenic elimination; and the ‘health’ measures developed in the “child killing programmes” became the prototype for the later eugenic health programmes against adults with hereditary or congenital conditions and then against Jewish people. “Auschwitz was only the last, most perfect Nazi killing center”. And now today once again Down’s syndrome and Spina Bifida are authorized as “conditions considered a basis for killing” and unborn children with these conditions are now being identified and targeted by a Government pre-natal screening programme that facilitates eugenic selection. For some nine out of every ten children identified with these conditions the New Zealand government endorses maternal “choice” to consign the lives of these innocent, utterly defenceless human beings to termination by Government approved doctors. We can understand that “selection” has been replaced by “choice”. We have moved from choice about unwanted pregnancies to choice about the type of child we want to have, the field of eugenic selection. Now parents are being openly accused of failing to prevent the births of their children. The right to choose to prevent births is fast becoming the duty to choose birth prevention. We can’t go any further down this track. We must draw a line here, now. Take a stand in human solidarity with every mother and with every child before as well as after birth. Today we commit to the human rights defence of every child with Down syndrome, every child with Spina Bifida, every child with any condition being “considered a basis for killing”. We defy eugenics and we recommit to loving “every child, without any exception whatsoever”. We are one human family. At SavingDowns we love every child and defy eugenics. We are drawing the line here, and now. Great article Mike. I have to say I feel rather resentful at having had to go through pre-natal screening for my now teenager with DS-all the angst, emotional tourmoil and grief for nothing. He’s a darling human being who has the capacity of the most human of emotions-love! Society, politicians, doctors, geneticists and co are not telling the truth about DS and parents are terminating their pregnancies unnecesarily. In doing so these parents and families are missing out on dearly loving, and being well and truly loved in return, their child with Down syndrome. Shame, shame, shame…….